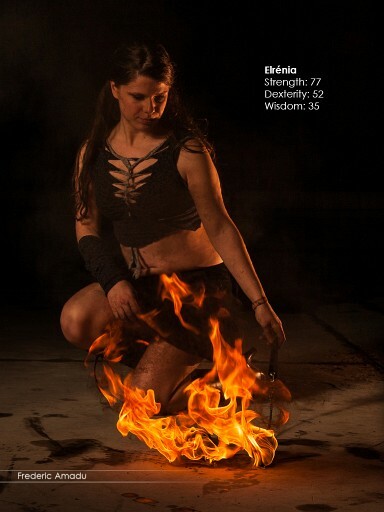 I started shooting fire after participating in a shoot by Von Wong and DAS in Paris in November 2012. I took a few snaps while the shoot was going on and I carefully looked at Ben’s methodology and setup. Back home, I said: “whaoouuu, I really want to explore fire and photography more”. 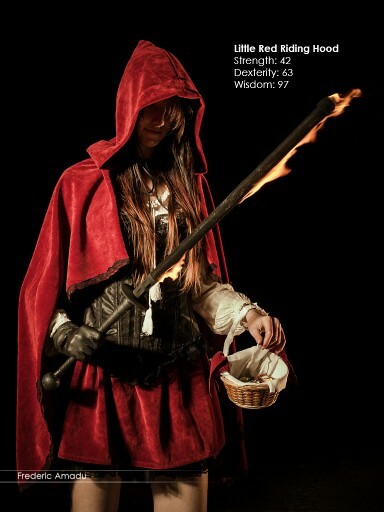 A few months later, and a lengthy discussion with DAS, we put together my first fire shoot. The tale unfolds after the jump.If you ever go to Paris, and are into fire, make sure you visit Palais De Tokyo. 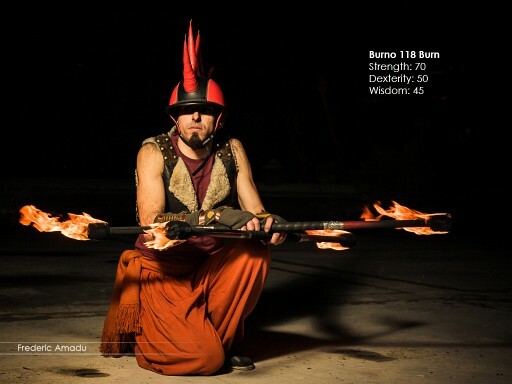 The place is known for sporadic (and not so sporadic) gatherings of fire breathers and jugglers. This made it the perfect spot for DAS and me to explore and experiment with the fire techniques needed for the shoot. And boy did we test. 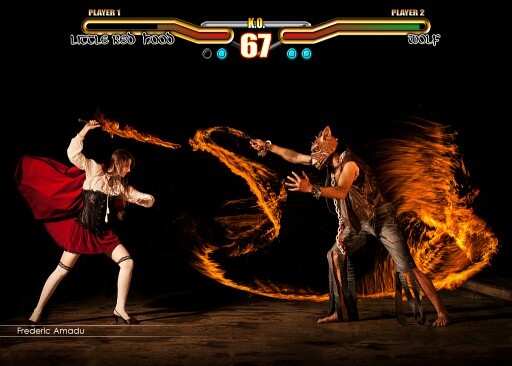 The idea that I had was using fire and long exposure shots to build the same kind of fight game special effects you see in games like the legendary Street Fighter. For the series I collaborated with the Palais de Tokyo fire artist, and we thought of appropriate clothing and styling for characters that fit in the game. And thus the breathers fighters story begins. 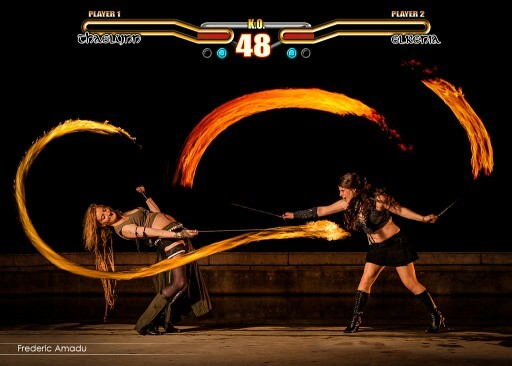 For each sessions we had a few pictures, a portrait for each of the fighters and a fight scene. The portraits are all done in a very similar way, using one off-camera strobe to get a short exposure on the model. 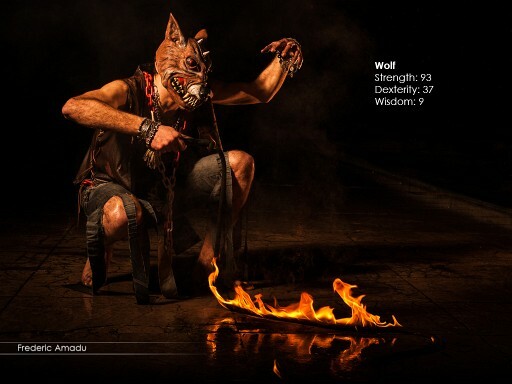 This is crucial because fire looks at its best at short exposures (depending on the fire intensity and shape) and a strobe is necessary to light the face and body of the model. Without a flash you will have a crappy choice of over exposed flames or underexposed faces. 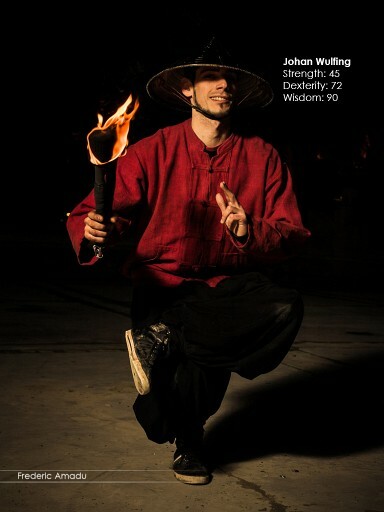 The flash power and camera aperture depend on the intensity of the fire, it is really a matter of experimentation. In my case, the off-camera flash (with a cheap wireless transmitter), could sync up to 1/200, so this is where we set the time value for the manual exposure and played with aperture and strobe power. Generally speaking, fire is very bright. To get beautiful, sharp fire detail even at long exposure you want to set the camera to the lowest sensitivity possible. 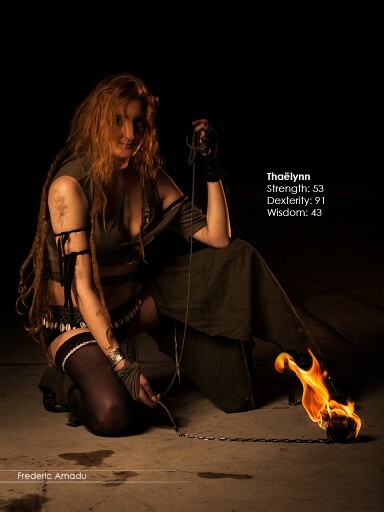 In our case we started with ISO 100, F22 (and adjusted depending on the fire intensity). In that case the strobes don’t have enough power to correctly expose the scene. So some compositing is needed: one shot for long exposure fire effects (100ISO, F22, 0.2 to 1s) and another for the characters (200 or 400 ISO, F4 to F8, 1/200). The images must be framed exactly in the same way. This is why a tripod must be used. Guard the tripod with your life, if it moves even at the slightest, compositing will be extremely hard…. some shoots need more than hours. The images are merged together in post production on a process similar to HDR process. 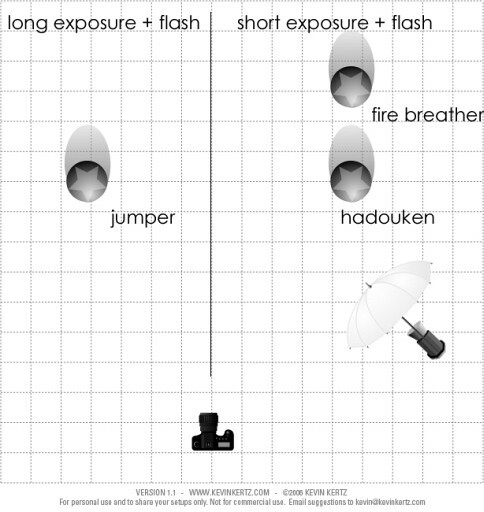 The following diagram describes the light and exposure setup. On the right side we have a the short exposure part of the composite which is good for fire breathing. On the left side we have the long exposure which is good for the movement effect. 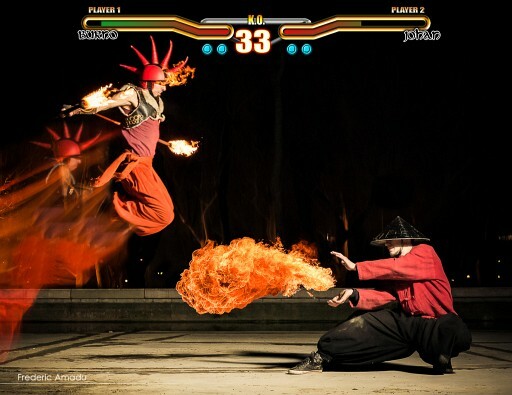 A fire breather is hidden behind the right fighter (about a meter away for safety reasons). 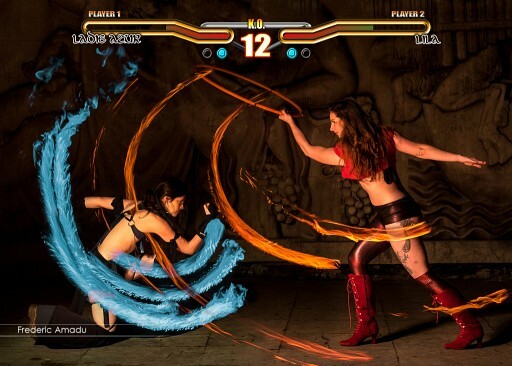 The left fighter is shot separately with a long exposure mode. As I used a cactus V5 wireless trigger, I cannot use my flash in HSS (high speed – more than 1/200) mode and I cannot control the flash on the 2nd curtain, so, the final scene composition is built with 4 images. A short exposure (1/200) with the flash synchronized to the camera to fixed the jumper in the air. A short exposure (1/200) with the flash synchronized to the camera for the fighter. Frederic Amadu is a French photographer from France. You can follow his website here and his Facebook here. You can find higer quality version on Frederic’s Burner Fighters page. P.S. A while back we shared an ambitious project with a similar concept that did not use any compositing. 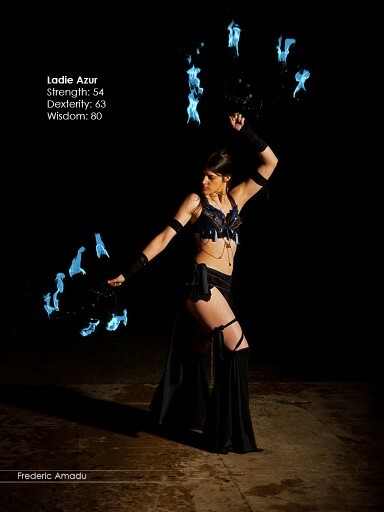 Interestedly enough it was done by Benjamin Von Wong who inspired this shoot. A detail: I think the link to the facebook page has a small error. Please do tell: did you experienced noise band radio triggers from cactus V.2 through 4 were causing with Canon 5D?